The MEF's Professional Certification program identifies the industry's leading professionals and showcases expertise and excellence in technological knowledge and understanding of Carrier Ethernet service specifications and definitions. 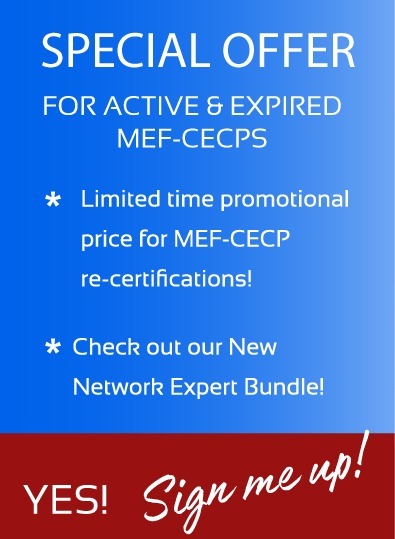 For more information on the MEF-CECP exam click here. MEF Network Foundations is the cornerstone of the recently introduced MEF Network Certification Framework, the road map for the skills to equip the next generation of networking professionals. The MEF Network Foundations certification is the starting point for the integrated family of networking technology certifications being built by MEF and leading organizations worldwide. For more information on the MEF-NF exam click here. MEF-SDN/NFV Certified Professional skills certification is the first ISO-standard exam that validates knowledge, skills, and abilities in the domains of SDN and NFV. Expertly designed to validate the practitioner-level technical skills of SDN and NFV network/telecom operators and engineers. The certification exam blueprint is available here for you to review, as well as for training companies, authors, and curriculum developers to prepare training materials. For more information on the MEF-SDN/NFV exam click here.